Here is another challenge card. 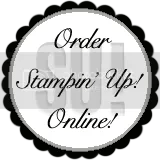 This one is for the Stampin’ Up! Late Night Stampers Challenge 140. The card is made withChocolate Chip Card Stock. The Peach Parfait CS panel was stamped all over with a leaf from the Gently Falling Stamp Set in VersaMark Ink and adhered to the front of the card. I then layered a smaller piece of Peach Parfait Designer Series Paperonto another piece of Chocolate Chip and adhered it to the left of the card. The truck stamp is from Loads of Love Stamp Set and the pumpkins are from the Loads of Love Accessories Set. (These two Stampin’ Up! sets go together. The Loads of Love Stamp Set has the truck, a Christmas tree, hearts, flowers, and sentiments to go with them – 7 stamps in all. The Loads of Love Accessories Stamp Set has a lady’s head, man’s head, pumpkins, dogs, presents, Easter eggs, furniture, and sentiments to match all of them – 12 stamps in all.) The truck and pumpkins were stamped in Chocolate Chip Ink on Naturals Ivory CS and colored with Watercolor Pencils. A little bit of Chocolate Chip was sponged around the bottom of the truck and then it was adhered to Chocolate Chip CS, as well. That panel was adhered to the card with Stampin’ Dimensionals and a Hemp Twine bow was added. I stamped the sentiment on a scrap of Naturals Ivory CS and cut it out with the Decorative Label Punch…Yes I know it’s a lot smaller than the punch. There’s a little trick to it very similar to the tiny oval I made on the card in the previous post! Two rhinestones were added to the tag and it was also adhered to the card with Dimensionals. I hope you like it! All week I’ve been doing challenges on different websites. This card is for Unscripted Sketches Challenge #125. You all know how much I love the Bird Builder Punch! So here it is again. This time I’m using Peach Parfait Card Stock and Peach Parfait Designer Series Paper. I love this color, too! I embossed the paper with the Finial Press Embossing Folder and also used the Modern Label Punch. 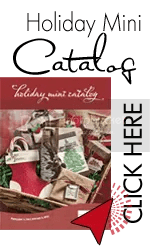 I just can’t get enough of the Gently Falling Stamp Set out of the newHoliday Mini Catalog! One of the great things about this set is that the leaves can be stamped in greens or in fall colors. I made this card for the Splitcoast Stampers Wednesday Sketch Challenge. The card is made out of More Mustard Card Stock. It was layered with a slightly smaller piece of Crumb Cake CS that was first embossed with theVintage Wallpaper Folder. I stamped and embossed the leaf with Gold Embossing Powder on More Mustard CS, then cut them out. They were each adhered (with Dimensionals) to 3 seperate rectangles of Chocolate Chip CS, which had all been stamped in VersaMark with theEn Francais Background Stamp. The 3 panels were then equally spaced and adhered to the panel of Crumb Cake CS. A piece of Hemp Twinewas knotted on both ends and adhered to the bottom of the card withCrystal Effects, which will hold just about anything. The sentiment is from the Creative Elements Set and was stamped in Chocolate Chip Ink on Crumb Cake. It was layered with Chocolate Chip and More Mustard CS and adhered (with Dimensionals) to the bottom of the card over the twine. I love it! Hope you all do, too. Don’t you just love Challenges? I know I do! You are given a sketch to follow. You choose the paper, stamps, inks, etc. 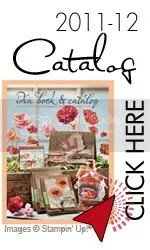 that you want to use on your card, scrapbook page, etc., and then you go to town! I made this card for the Paper Players Sketch Challenge #65 this week. Want to know how I got that small oval for the sentiment? I stamped the image on a scrap of Whisper White CS and punched with the Stampin’ Up! Scallop Oval Punch! Because the punch is way too big for what I wanted, I had to make some adjustments. After stamping the sentiment, place the card stock into the punch sideways with the words close to the right-hand side of the punch. Then adhere the punched piece to a Post-it Note or a larger piece of card stock with a removable glue dot or tape to hold it. (This makes it easier to get the small piece lined up in the punch.) Place it back into the punch so that the words are close to the other end and the scallops in the middle are centered. Punch again and Whaa-laa, easy peasy! To make the mat for it, adhere your punched out piece to a scrap of Garden Green Card Stock and do the same thing over. I just punch it a little bit larger.